This is a long overdue tribute. A leader among us has been misjudged — maligned — persecuted and character assassinated. It's time I speak up. Brethren, sometimes I think we are poor judges. God says to us: "Know ye not that we shall judge angels? how much more things that pertain to this life?" (I Corinthians 6:3). The following verse says we should set them to judge who are least esteemed. Yet it has been some of the MOST esteemed, in highest positions, who have flagrantly MISjudged, indulged in character assassination and deliberate persecution. It's time I should speak out and I shall delay no longer! God teaches, "Render therefore to all their dues... honor to whom honor" is due (Romans 13:7). But I hasten to add, the condemners and persecutors are mostly no longer even members of God's Church. Perhaps what I am about to say is one of the sad reasons. These were also those — and some were of evangelist and vice presidential rank — whom I frequently found it difficult to contact by phone in their offices. They usually arrived at the office an hour or more late. If I called at 11:50 a.m., a secretary would say sweetly, "I'm sorry, but Mr... has gone to lunch. If I called at 1:20 he would not be back yet from lunch. If I called at 4:45 in the afternoon the same sweet secretarial voice would say, "Mr... is gone for the day." One or two of these men had to have the largest desks at headquarters, while I carried on the chief executive's work from a tiny cubbyhole of an office, too small for a man's smallest desk, over a small, woman's boudoir, table. Yes, when I think back, "those were the days!" Some young men with fairly recent college degrees were real important "BIG EXECUTIVES" — in their own estimation. Sometimes I thought the only real work they ever did was spend time wondering whether Mr. Armstrong was working hard enough! What a shame — they are no longer with us! But the WORK is really getting done, today! I am reminded of how Jesus was teaching His future apostles one time. He said: "So likewise ye, when ye shall have done all those things which are commanded you, say, We are UNprofitable servants: we have done that which was our duty to do" (Luke 17:10). In other words, Jesus says that if we do ALL that is our duty — ALL that is required — we are still UNprofitable servants. The profitable servant does more! He thinks! He thinks about his job — his duty — and he sees extra things that need to be done - and he does them, even on extra time! He doesn't watch the clock. It is not ONLY how many hours he puts in — he does what needs to be done even if it takes many extra hours. He isn't thinking about how many hours he gets paid for — but the great job God has for us to do, and what falls within his jurisdiction regardless if it takes "extra hours without extra pay." And he doesn't try to take over the "boss's" job. I think that our executive and office people at Pasadena do not shirk their duty, and we have men who do far and away more than their duty. They do measure up to Jesus' standard of being faithful servants of Jesus Christ. On the present trip with me — I am writing on my European and Middle East trip — are two of our younger elders — though both are married — Kevin and Aaron Dean. They really do work — with enthusiasm. They are stewards on the aircraft, and both have important ministerial jobs at Pasadena when not flying. They do far more than their duty — from the heart! Almost 54 years ago the HEAD of God's Church — the living Jesus Christ — called me to be God's begotten son and Christ's apostle. At the time I studied and went into deep research to learn of Him, often studying until 1 or 2 am. and starting early in the morning. I have never watched the clock — except to keep appointments. In my 89th year I still work at all hours of day or night. When traveling, I work at makeshift desks or tables too high for my typewriter, having to find sofa cushions or something to pad up the chair seat so I can work at my typewriter. God started the Work of the Philadelphia era of His Church through me in a tiny one-room, 36-seat country schoolhouse. Often I have had to work with improper facilities — but the main thing was to get the Work DONE! Through the years God has given me — called to assist me — many people. This started about 1935 with a woman secretary half time, then a full-time secretary, then gradually more and more. Some whom Christ has given me to help have really been PROFITABLE SERVANTS — they have done far more than their duty! One of these was Mr. Stanley R. Rader. He saw that our accounting system was crude and totally inadequate. I hired him on a fee basis and he set up for us one of the most sophisticated accounting systems in any institution or corporation. He was already a CPA (certified public accountant), but he added to his UCLA degree by enrolling in the Law School of the University of Southern California and graduated with highest grades on record. Yale and Harvard Law Schools wanted him on their faculties. But he had begun to catch the vision of God's great Work — and I think he not only liked us, but liked me personally — and he stayed on with us. After a while I asked him to come with us full time. He did. God had given him an active brilliant mind — and he used it. Through investment bankers Mr. Rader got us adequate financing, into millions of dollars for the new building program of the college at Pasadena — then also for Bricket Wood, England, and Big Sandy, Tex. Twice I was able to borrow a million dollars cash of the largest bank in Philadelphia, Pa., on my own signature — WITHOUT SECURITY! But it was Mr. Rader who arranged it. All I had to do was meet top bank officials at a luncheon in Philadelphia — for they wanted to see me personally before they risked that much money on me — but Mr. Rader had given them confidence in me and the Church. Incidentally, all loans were paid back on time. When I started taking advantage of the door Jesus Christ was opening before me by being invited to visit kings, emperors, presidents and prime ministers all over the world, frankly I could not have carried this responsibility on had not Mr. Rader accompanied me in all these private personal meetings. Together we have undoubtedly had private meetings with more heads of governments than any other man on earth. I did not see them to try to convert them — but to win their confidence and friendship SO THEY WOULD OPEN THE DOORS FOR US TO PROCLAIM CHRIST'S GOSPEL WITHIN THEIR COUNTRIES TO THEIR PEOPLE! Mr Rader knew just how to talk to them in terms of world governments, world conditions, and, of course, I know the world condition, its causes — and together we have been able to talk to the leaders of these many nations in their own language and win their confidence and friendship. Without Mr. Rader I simply could not have carried on this very important worldwide Work. And in all, he has not in any manner tried to take my place, nor belittle me as some other men who have had evangelist and vice president rank have tried to do — to push themselves into the top seat in God's Work. Christ had not called those men for that position, or they would be in it! But some of them — men NOT IN THE CHURCH ANY LONGER — did everything in their power to character assassinate Mr. Rader — to speak evil of him FOR NO REASON — to persecute him — to GET RID OF HIM! Now I have said, if they know some evil about Mr. Rader, why not come right out with it, charge him with it and PROVE IT? THEY NEVER DID! Why did they turn many against Mr. Rader? What BAD thing has he done? They have never been able to say specifically. They just wanted you to THINK he is bad — NO REASON except they wanted you to believe so. God says "speak evil of no man!" They have broken that commandment without reason! Now when these men, wanting the top position for themselves and jealous of and fearing Mr. Rader, started defaming him, HOW ARE YOU TO KNOW. They wanted you to think Mr. Rader was BAD — ought to be got rid of! Should YOU believe them? How could you KNOW? How avoid MISjudging? Jesus said, "By their FRUITS shall ye KNOW!" Not guess or MISjudge — but shall KNOW. I look at their underhanded propaganda AGAINST him — in which THEY NEVER ONCE TOLD YOU WHAT he had done that was wrong — never came out openly with any specific accusation — they just wanted you to THINK — because they said so — that he is somehow BAD and I ought to get rid of him — and they did plot to get rid of him — but they NEVER SAID WHY — there was no specific thing of which they could accuse! But what did I do? I LOOKED AT THE FRUITS — at his performance — AND ALL GOOD! So I kept Mr. Rader on — but THEY are no longer with us! I looked at their fruits too! And not only were their fruits bad, but by Jesus' definition, they were UNprofitable servants! Mr. Rader has been touring the world with me, helping me take Christ's Gospel into many nations and helping plan for me to speak to many large audiences and important groups high in government and in business, including many Rotary Clubs, Lions Clubs. Kiwanis, and Jaycees and others. When we began these travels — and arduous travels they have been — Mr. Rader began to use spare moments in learning to read and speak and understand French. Today he has an excellent French vocabulary and can converse in it, write in it, read it like a native Frenchman. But now one thing more. Mr. Rader has also been studying the Bible and learning from me. I don't mean I spend all my time teaching him or he spends all his time listening to my teaching. But he does have an alert, quick and active mind — he's certainly "all-A student" caliber and much more, for he's much more than just a student or scholar. But he has a brilliant mind — he grasps and understands quickly — he THINKS! He makes the most of his time. But does he do what is required of him? Apply that test of Jesus. If he does what is expected — what is required — and no more, then he would be an UNprofitable servant. But he does far, far more! He will work at any hour of the day or night. When at Pasadena, he usually is the first one at the office in the morning. Let me tell you what inspired this long overdue tribute. I am writing this in Paris, Nov. 5, the day after the U.S. presidential elections — a Wednesday. We are to have another meeting with King Leopold III tomorrow. On Monday, with the mayor of Jerusalem, Teddy Kollek, he and I had a half-hour private meeting with Prime Minister Menachem Begin in Jerusalem. I flew over to Paris in our G-II plane yesterday, Tuesday. But Mr. Rader insisted on getting up at 4 a.m. yesterday morning to catch an early commercial-plane flight to Paris — and WHY? Just to arrive in Paris about four hours ahead of me to be sure to arrange personally for my hotel accommodations — getting me the best and taking a smaller room for himself. He could just as well have slept until 7 and had a more comfortable flight with me. It was not his DUTY — not required of him — but he wanted to be sure I would be comfortable. That is just one example. Things like that have happened HUNDREDS OF TIMES. He is always doing far more than required — far more than duty — going all out for the Work — for helping me carry out Christ's great commission. One of the greatest doors opened for us in recent years — or all time — is the fact The Wall Street Journal has been willing to accept my campaign of FULL-PAGE advertising MESSAGES proclaiming the Gospel to the great and near-great of America IN THEIR OWN LANGUAGE! It was Mr. Rader's unique and special abilities that Christ utilized in OPENING THAT IMPORTANT DOOR! He is of GREAT help to me in ideas for these messages. But when the State of California launched its civil lawsuit against God's Church, then if ever, were Mr. Rader's services necessary to God's Church and His Work. Mr. Rader's accusers wanted to "cave in" and let the political government of MAN take over and operate — AND DESTROY — the GOVERNMENT OF GOD! The only place on earth the Government of God is being administered today is in the Worldwide Church of GOD! SATAN hates the Government of God. God set him (when he was the supercherub Lucifer) on the THRONE OF THE EARTH to administer the GOVERNMENT OF GOD. He rebelled! He destroyed the Government of God ON EARTH! He still sits on that THRONE of the earth as the invisible and powerful god of this world! He tried to destroy the Christ-child! He tried to destroy (spiritually) Jesus just before He began His earthly ministry at age about 30. When Adam fell before Satan and rejected the Government of God, God said to Adam, in effect: "Adam, you are the father of the WHOLE WORLD — who shall be born generation after generation from YOU. You have rejected for yourself AND for your FAMILY (the whole world) my Government. So GO, form your own human governments. You and your children will be swayed and led by Satan in the kind of governments you will form. They will really be SATAN'S governments — NOT MINE!" And so, look at the governments in this world. There has been autocracy, imperialism, republicanism, democracy, communism, fascism. All Satan's governments. Actually, whether we like to admit it or not, the government of California is part of that satanic system. Satan controls it. SATAN USED IT TO DESTROY THE GOVERNMENT OF GOD, which Jesus Christ restored to a very limited part of this earth through the Worldwide Church of God. Look at the national government of the United States. 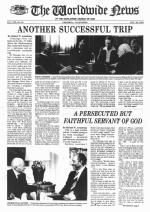 President Jimmy Carter suffered AGONY in a landslide defeat. Ronald Reagan enjoyed ECSTASY! But his OPPONENT, whom he had fought and who fought against him, calling him a warmonger, had to suffer AGONY. That's the way it is in Satan's world. One ENJOYS the exhilaration of winning only by causing his antagonist to SUFFER AGONY. But four years ago Jimmy Carter enjoyed ECSTASY. Did he have sympathetic pains because Gerald Ford then suffered AGONY? Of course not! Satan's government from Rome sought to put Jesus to death. Jesus DID NOT HAVE TO SUBMIT because He did no wrong. He WOULD NOT have submitted, either — except for YOU — and ME! He only submitted in order to take the penalty of your sins and mine on Himself and pay that penalty FOR US in our stead! Paul was arrested. They wanted to try him before a kangaroo court in Jerusalem, where he would automatically have been FALSELY judged "guilty." Paul DID NOT SUBMIT. He appealed to Caesar at Rome. We did not submit. We appealed to the California Supreme Court and were on our way up to that court when the California legislature debated on passing a bill NULLIFYING the law on which the attorney general was going to DESTROY God's Church and God's Government! We did not get into the politics of that legislature bill — directly. But I wrote ads — FULL-PAGE NEWSPAPER ADS — and Mr. Rader got them in Sacramento, Calif., newspapers — and Mr. Rader went to Sacramento and went on TALK SHOWS on television and radio, going to the public about our case — and we know all this did have some influence in the California lawmaking body RESCINDING the law on which the attorney general based his whole unconstitutional case falsely against God's Church. Those ministers then at the TOP, who wanted to "cave in" and go with Satan in DESTROYING the Government and the Church of God are no longer in the Church. God showed me definitely what He wanted me to do. I FIRED the top two men who pleaded with me with raised voices to "cave in" — and I excommunicated them from the Church of GOD! You have NO IDEA how tirelessly Mr. Rader worked to SAVE THE CHURCH — to preserve God's Government in the Church and on earth — as a limited Government over His Church ONLY until Christ comes to RESTORE GOD'S GOVERNMENT over the whole earth! He is not the only one in God's Work doing MORE than required — but NO ONE in the Work goes farther, in striving to go ALL OUT completely beyond normal required performance to GET THE JOB DONE! I know many of our field ministers are by Jesus' same definition good and "profitable servants." God will bless and reward all of you. But I think none has had to suffer such vilification from within the Church — by men in high position — even if those men are no longer even themselves IN the Church. And none can have gone farther to do far BEYOND what is normally required.